Paris Saint Germain’s bid to break Ligue One’s one hundred point barrier continues on Sunday night when they host Strasbourg at the Parc de Princes. The two sides come into the encounter buoyed by midweek victories. 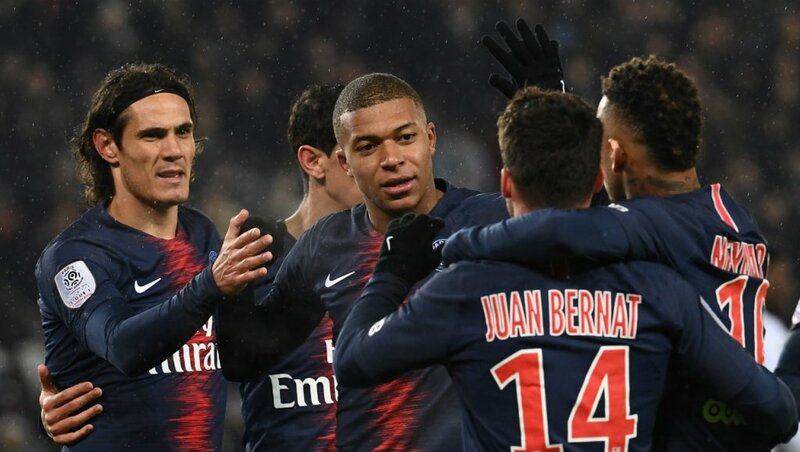 PSG brushed aside Nantes 3-0 in a French Cup last four tie to book a final date with Rennes who conquered Olympique Lyon 3-2 at Stade Lyonnais. Racing Strasbourg meanwhile obliterated Reims 4-0 in their Ligue One game in hand, just three days after they outlasted Avant Guingamp 4-1 in a penalty shootout to win the Coupe de la Ligue (French League Cup). The Parisians are stonewall favourites to win their fifth league title in six years as they boast a twenty point cushion over Lille with a game in hand. Surprise package Lille Metropole make the difficult trip to France’s champagne country where they confront a Reims side losing steam after a barnstorming start to the season, following their return to the top flight. Christophe Galtier’s visitors are confident of defending a four point cushion over third placed Olympique Lyon, who have an easier assignment at home to struggling Dijon. Lyon are looking to bounce back from Tuesday’s surprise semifinal French Cup defeat to Stade Rennais. At the opposite side of the table, it’s all or nothing for struggling Guingamp, whose Coupe de la Ligue final defeat misery was compounded by a 0-2 Ligue One setback at the hands of Montpellier on Tuesday night. Guingamp host AS Monaco in a relegation six pointer encouraged by the 2017 champions’ surprise 0-1 defeat at the hands of rivals Caen last Sunday. Other fascinating encounters to look forward to include Olympique Marseille’s visit to Girondin Bordeaux; Stade Rennais’ trip to Angers and Toulouse’s match up with Nantes. Nimes are at home to Caen and Amiens battle Saint Etienne in one of the other Ligue One fixtures.